If you want to build a tall house, you need to use scaffolding. Professor Ye Zhang and colleagues at the Okinawa Institute of Science and Technology Graduate University (OIST) are applying this construction principle to their lab work, with one major difference: The materials they are working with are just a few billionths of a square meter in size. Nanoscale construction is a field of nanotechnology that uses nanomaterials as basic building blocks to create materials with specific features. In the field’s early days, researchers investigated the potential of building nanoscale/microscale structures using single molecular components. Now, scientists are inspired by the biological world which involves a much more complex process with interactions between many different components. In living organisms, complex molecular structures are constantly constructed and deconstructed during the organism’s life cycle. For instance, in order to move around within the body, cells must interact with their external environment, known as the extracellular matrix (ECM). The ECM is the natural fibrous scaffold that provides structural and biochemical support to the surrounding cells. To create space for themselves to move around, cells secrete protease enzymes, which partially digest the ECM. Conversely, molecules in the ECM can also support or suppress processes within the cell itself. Taking inspiration from the biological building methods used in cells and the ECM, the Bioinspired Soft Matter Unit, led by Prof. Zhang, has designed and synthesized a nanoscale toolkit of molecules that can interact together to assemble complex molecular structures. Their work was recently published in Angewandte Chemie International Edition. The researchers designed and synthesized two molecules based on a fragrant organic chemical compound called coumarin. One is a peptide molecule which self-assembles into nanofibers. These come together to form a molecular “scaffold”. The other is a benzoate molecule which self-assembles into sheet-like nanostructures. These sheets form molecular “bricks”, which in turn take shape as molecular towers. When these molecules are mixed together, they separate themselves by type, self-assemble and then interact together to build higher-order molecular structures. The peptide molecules self-assemble into long structures called nanofibers, which come together to form a molecular “scaffold”. The benzoate molecules self-assemble into sheet-like structures called nanobelts, which layer on top of each other to form molecular “bricks”. With the help of the scaffold, the bricks form molecular towers. The researchers changed the structure of the molecular scaffold by using UV light or an enzyme to cleave the nanofibers, which allowed them to manipulate the height of the ‘molecular tower’. 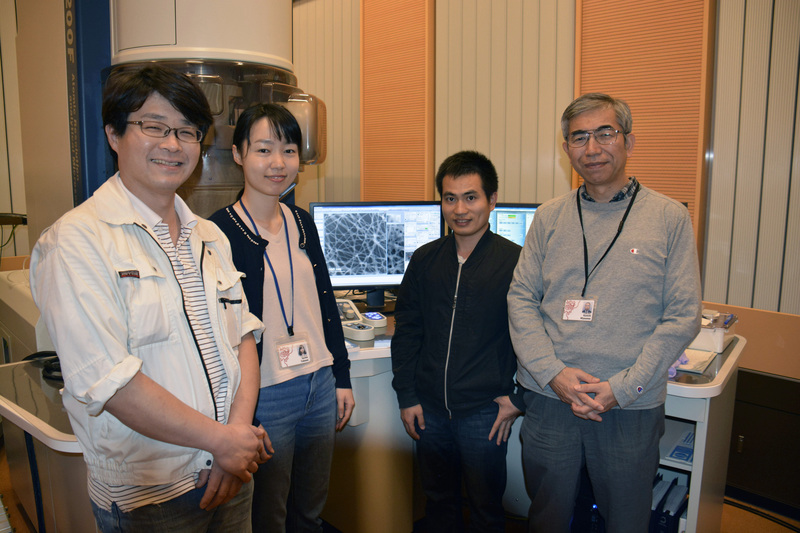 They used scanning electron microscopes at OIST to observe structural features of the molecules, such as layers and shapes. Then, with the help of OIST technicians, they used atomic force microscopy to measure the exact height of the molecular towers in nanometers. Technicians from OIST’s Imaging Section and PhD students from the Bioinspired Soft Matter Unit who contributed to the study. From left to right: Toshio Sasaki, Sachie Yukawa, Shijin Zhang and Kun'ichi Miyazawa. They showed that the fibrous peptide scaffold regulates the height and architecture of the molecular tower. 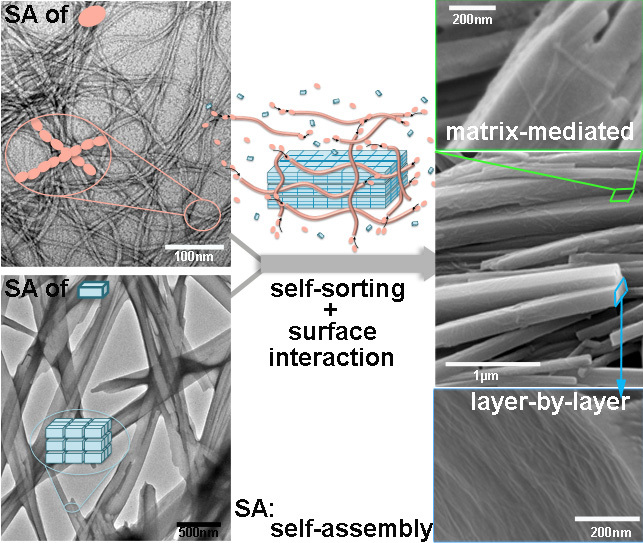 With the help of this scaffold, which provides support through surface interactions between the nanostructures, the benzoate bricks can form taller structures. “Whereas the molecular bricks alone can build towers of up to 100 nanometers, when we added the fiber, they could build towers of up to 900 nanometers,” says Prof. Zhang. The fibrous molecular scaffold supports the molecular bricks, allowing the molecular structures to grow nine times taller than is possible without the scaffold. By mimicking the molecular self-assembly process that occurs in living organisms, chemists can learn new methods of chemical synthesis of nano/micro-structures. In the future, the Bioinspired Soft Matter Unit hopes to construct specific molecules on biological membranes to regulate cell fates. For instance, by building molecules on cell membranes, they hope to one day be able to manipulate the spatial organization of membrane proteins.